Moroccan saffron is the spice of the Gods and here you can read its story. Saffron is one of the most valuable spices in the world. People treat it as a distinct substance in their food recipes and they are actually mad about it. It's exotic aura and not only makes them call it a Spice Gold. This distinct flavour can grace numerous kinds of dishes from different countries with just a few strands. What different cultures use it for? -The Italians: make risotto a la milanese. -The French: make bouillabaisse, which is a spicy fish stew from Marseilles. -The Moroccans: use it for kefta (meatballs with tomato), mqualli (a citron-chicken dish), and mrouzia (succulent lamb dressed with plums and almonds). Also, is essential for the chermoula herb mixture. -The Uzbeks: use it in a special rice based offering as wedding pilaf. -The Iranians: make the chelow kabab. -The Spanish: the zarzuela fish-seafood stew and paella valenciana. -South India: the Kesari bhath. -In England: the saffron “revel buns” were traditionally baked for anniversary feasts (revels) or for church dedications. West of Cornwall: large saffron “tea treat buns” signify Methodist Sunday School outings and activities. It has an amazing flavor and makes the simplest risotto or fish broth luxurious! We sure you that you’ll be able to notice its strong smell before even opening its package! Moroccan Saffron is derived from the dried stigmas of the saffron crocus Linnaeus, commonly known as Rose of Saffron which only blooms for three weeks every fall and has a deep auburn colour and sweet flavour. 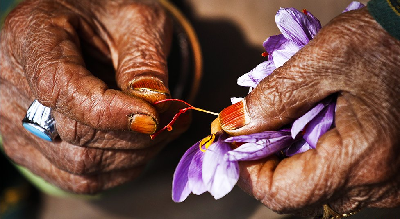 The stigmas can only be picked by hand and it takes 250,000 stigmas to make just half a kilo of saffron! -Many plant derived chemical components which are known to prevent diseases. -Volatile oils such as cineole, pinene, borneol, geraniol etc. and non-volatile active components like carotenoid compound that are anti-oxidants beneficial to the body. -Contains potassium which helps cell formation, maintains the blood pressure and keeps heart diseases at bay. -Minerals including calcium, vitamins, proteins etc that ensure the maintenance of optimum health. -Promotes digestion and is antidepressant. -Treatment of acne and blemishes. But be careful! Most of the saffron that you can find around is of low quality and mixed thus its very low prices. The customers that have experience with this spices prefer to avoid the cheap ones in order to enjoy its original flavour and health benefits in their dishes. Our customers have been convinced about the quality of our product because they take into account 2 facts that you can see in the following two pictures. -The pure saffron can quickly paint the water that is immersed in. -The pure saffron does NOT lose its colour. 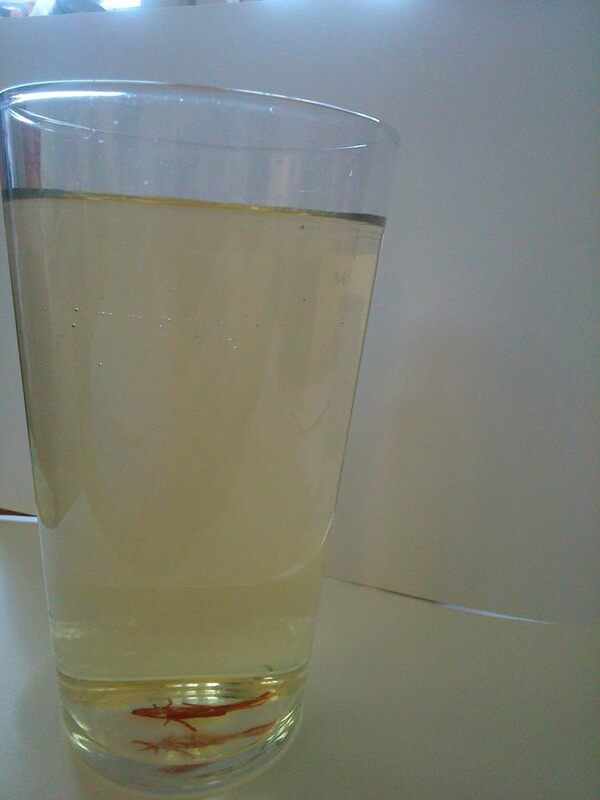 Below you can see a pint(440ml) full of water from two different angles. 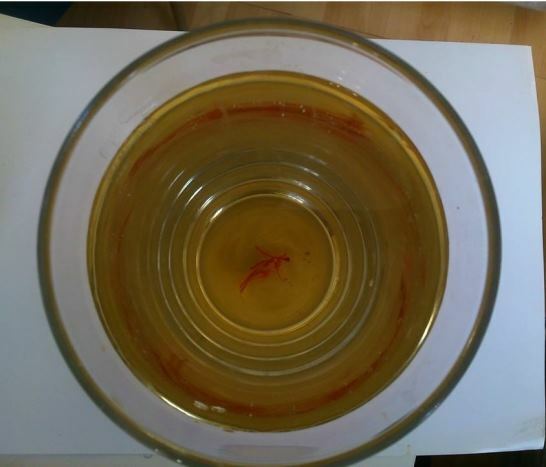 As you can see 4-5 strands of saffron were enough to easily paint the water and make it almost brown after 10 minutes. You can even compare it with the colour of the floor next to it. At the same time you can see that our spice has retained its scarlet hue. An artificial one would have already lost its colour. Our high standard saffron from Taliouine of Morocco that has a long tradition in its production. Its authenticity is certified by the kingdom of Morocco itself! The prices of the original saffron range between £8- £10 per gram. However, we are so excited to have the chance to offer you the greatest quality in a price not easily found around. When you use it you need just 3 to 12 filaments per serving, depending on how strong a flavor you want. Use a pestle and mortar. After ensuring that they are smooth, crush the saffron in it. Boil water and mix it with the crushed saffron in a container. Cover it and leave the infuse for several hours. Instead of water you can also use wine, milk or any other liquid you desire.